Meanwhile, in the Gold Coast, J.B. Danquah had formed the United Gold Coast Convention (UGCC) to work for self-government by constitutional means. Invited to serve as the UGCC’s general secretary, Nkrumah returned home in late 1947. As general secretary, he addressed meetings throughout the Gold Coast and began to create a mass base for the new movement. When extensive riots occurred in February 1948, the British briefly arrested Nkrumah and other leaders of the UGCC. In 1947 the United Gold Coast Convention (UGCC) was established, and Nkrumah returned to the Gold Coast from London to become its secretary. This national movement was essentially middle-class in origin and conservative in its policies. Within two years, Nkrumah broke from this moderate organization and, together with like-minded radicals, formed the Convention People’s Party (CPP), which adopted the slogan “Self-Government Now.” It was supported by many segments of Gold Coast society that wished to see the end of British rule, including army veterans, small traders, and other nationalists. Nkrumah’s protests were eventually successful. After the British jailed him in 1950 for political agitation, they allowed a new national constitution to be drafted, with elections to be held in February of 1951. Although still under arrest, Nkrumah became the continent’s first African-born prime minister. After winning the 1951 election, Nkrumah’s CPP went on to win subsequent elections in 1954 and 1956. Nkrumah pressed for full independence, and on March 6, 1957, the Gold Coast became the first black African colony to be liberated from British rule. It merged with the former British Togoland to form Ghana. As the initial experiment in independent African democratic socialism, Ghana was subject to high expectations, and Nkrumah assumed a position of leadership among African as well as Western intellectuals and ideologues. Nkrumah implemented an active foreign policy to bring Ghana from the periphery of world affairs to a more important role in the struggle for African liberation and unity. He was instrumental in the creation of the Organization of African Unity (OAU), underwriting preliminary conferences on African unity and developing personal ties with other African leaders. He balanced his ties with the West by participating in the Afro-Asian movement and strengthening his relations with the Soviet bloc. By expanding the range and scope of Ghana’s international ties, Nkrumah hoped to break Ghana’s inherited dependency on external forces. In the early 1960s more than 60 ambassadors were placed in foreign capitals, and a special Bureau of African Affairs was created. Nkrumah’s explicitly global perspective was designed to bring about an improvement in conditions in all of Africa as well as in Ghana. The attempted assassination of Nkrumah at Kulugungu in August 1962—the first of several—led to his increasing seclusion from public life and to the growth of a personality cult, as well as to a massive buildup of the country’s internal security forces. 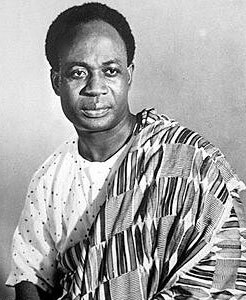 Early in 1964 Ghana was officially designated a one-party state, with Nkrumah as life president of both nation and party. While the administration of the country passed increasingly into the hands of self-serving and corrupt party officials, Nkrumah busied himself with the ideological education of a new generation of black African political activists. Meanwhile, the economic crisis in Ghana worsened and shortages of foodstuffs and other goods became chronic. On Feb. 24, 1966, while Nkrumah was visiting Beijing, the army and police in Ghana seized power. Returning to West Africa, Nkrumah found asylum in Guinea, where he spent the remainder of his life. He died of cancer in Bucharest in 1972.